Ghost photos are invariably in dispute. Today in the UK newspapers, for example, has been the report on the Wem Ghost picture. This has now been proven to be a girl superimposed from an old 1922 postcard. For 15 years people thought the photo genuine. 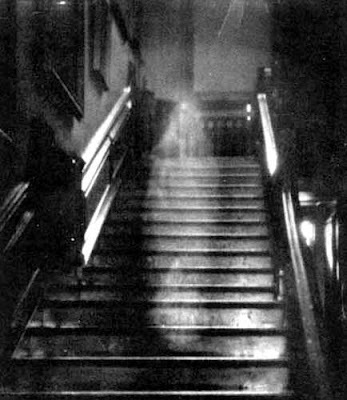 This reminded me of the Brown Lady Ghost of Raynham Hall (photo below) which, as far as I know, has never been shown to be a fake. Some call it the most famous ghost photo in England. There is a history to go along with the photo. The story is that the Brown Lady is the ghost of Lady Townsend who was imprisoned in the estate by her husband. She remained there until her death. 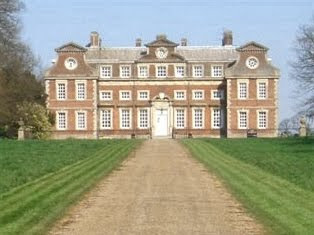 No wonder she was a might miffed and now hangs about Raynham Hall, which is in Norfolk, scaring people. There have been some famous sightings of her ghost. King George IV is said to have seen her while he was in bed. He looked up and there she was in a brown dress, pale faced and with her hair disheveled - which is no way to greet a king! This was way back during the nineteenth century. In the early 1800's a Colonel Loftus was at the hall for the Christmas festivities. He saw the ghost in the hall, again wearing a brown dress. She then disappeared. The Colonel, obviously a glutton for punishment, saw her a second time and noticed that her eyes had been gouged out. I guess that is the sort of thing you would notice. Sightings of the ghost continued. There was one by Captain Frederick Marryat who saw her gliding along the upstairs hallway. The story is that he fired a gun at her - no idea why - the bullet went right through her, which surely was to be expected, and lodged in a wall. As for the photo itself. This was snapped in 1936 by two photographers for the very respectable Country Life magazine. The gentlemen were the exotically named Captain Povland and Indre Shira. The subsequent photo was published in Country Life on December 16, 1936. Stories like this make me shiver. I think I saw a ghost once when staying in an old hotel but my bf said I was probably dreaming. I still think I saw it though, it was an old man with a grey beard.